Pacific Breeze met all our needs and the location was great. Your staff was great. Very friendly and efficient. Our only problem in the week was the internet.This house was so fresh and clean. It smelled good when we walked in. So very nice!! We had such a great time our kids all asked to go back next year. So, we have booked Sophie's Place for the same week next year. When I let our kids know the response I got back were "woohoo" and 'awesome". We are already looking forward to next year!!! Wifi was out, but fixed in a day. Everyone was wonderful!!! We were a group renting 4 condos. You were all great as I called your office telling you my needs in October. You suggested these and they were perfect. Everyone was pleasant on the phone in our dealings. What was really ideal was that you gave us 2 condos right next to one another which was great for group gathering. Excellent and efficient team. We felt as though they were friends before we even got there. We loved it. It was affordable, large and homey. We didn't want to leave. Very pleasant and quaint place to stay. Polite and helpful as usual. Could not recommend a nicer location to just kick back and relax. This is my third use of one of your rental properties and as before could not have asked for more. Thank You. Your team is always good to work with. We've rented homes from you before and have come back again because we have had a good experience in the past. Thanks & we hope to return again soon. Overall the property was in good condition & was perfect for our group. It was great to have our whole family all together in one place. One frustration was the kitchen disposal which wasn't working. Even though someone came to fix the clogged sink it still had problems during the week. Of course, things like that happen. We had a great time. Thanks for providing a great place for our family to stay! Thank you for letting us know about the sink issue. We are glad you enjoyed your stay and look forward to seeing you again soon. Your staff is always lovely and friendy and a pleasure to work with. And we look forward to your return next year. Ant and mnold problems. Dullest knives ever and terrible barbeque This type is so small could you make it bigger for completing this questionaire. I can hardly read my typing. Hope it is not full of typos Yes ants have been a problem in many homes this year. We are glad you told us about the ants so we could treat the problem immediately. As for mold - we have not detected any in this beach house and we were not aware of the problems with the knives or BBQ. We could have helped if we had known. Your team was extremely friendly and helpful in responding to a couple of safety issues with the house and our need for additional towels due to a sick child. We are always happy to help! We love it when you come to stay at Purdy House. The Purdy house is "our" beloved home away from home. The team was receptive and responsive - very friendly and welcoming. We had an absolutely fantastic vacation. The cottage was perfect for our family of 4 adults, 2 teens, and 3 dogs. The layout of the home worked perfectly so no one was ever underfoot. 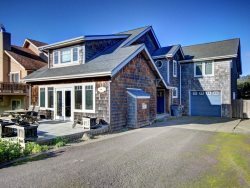 Everything Cannon Beach has to offer was mere steps away - all completely walkable from the house. The home itself was well kept and so charming! The kids went nuts when we were able to have a fire in the backyard fire pit and made s'mores. We couldn't have asked for better accommodations. All of the team members are friendly and helpful, made us feel welcome as soon as we arrived. There were two adults and 4 kids in our party; we found the home perfect for the 6 of us, with lots of room. From the moment we all walked in the door, we just loved it! Our kids had a wonderful time and each felt comfortable and at home.